For 21-years, Rob Blake's hard-nosed defensive play was a staple in the NHL. A Norris Trophy winner and Hall of Famer, he spent the majority of those years as one of the faces of the Los Angeles Kings franchise. 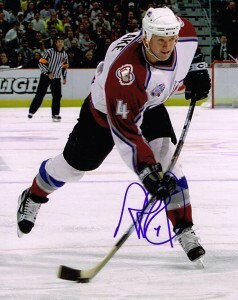 He also spent time with the Colorado Avalanche, where he won a Stanley Cup. 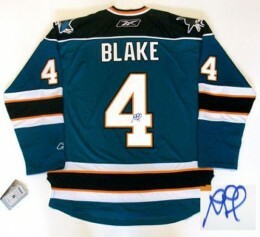 Blake's career ended with a brief stint with the San Jose Sharks. Rob Blake cards and autographed memorabilia aren't expensive but they are worthy of respect. Blake has seven rookie cards. They were released in 1990-91. As is the case with so many players who made their playing debut during this period, his rookie cards are very affordable. The significantly high print runs that were common at that time results in a simple economic model of supply exceeding demand and suppressing card values. 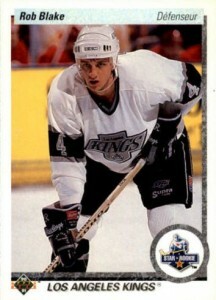 Rob Blake's first certified autograph card can be found in the 1995-96 Be A Player set. A die-cut parallel of the card was also produced. It is unknown how many of these cards were made as they both lack any serial numbering. His first memorabilia card is from 1999-00 Be A Player Memorabilia Update. The Teammates insert pairs Blake with fellow Kings legend Wayne Gretzky. It has swatches from each player. The highly coveted card isn't found in packs but rather it's randomly inserted in the update factory set. Rob Blake hasn't always been the easiest in-person autograph to get. It can be a bit of a hit-or-miss experience. As a result, the supply of his signed material is somewhat limited. 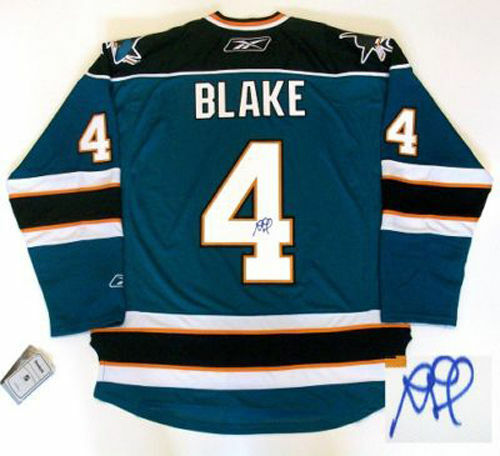 It is rare for a hockey player having played with high-profile teams, combined with Blake's longevity and accomplishments, to have such a limited amount of material. 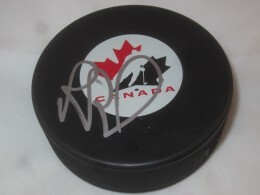 Below you will find an example of what Rob Blake's authentic signature looks like. This can be used as a first point of reference for determining the legitimacy of autograph memorabilia, but is not a substitute for having your items authenticated by a well-respected professional autograph authentication company. Some of the trusted sources within the sports memorabilia market include the following companies: PSA, JSA, Tristar, and Mounted Memories. Click on any of the images below to view full size photos. The signature consists of just a few characters. When signing trading cards, he often is more diligent with his penmanship. The first character is a combination of "R-b" with the "o" being implied. The second character, most often seen on memorabilia, is a "B-l" combination. All the letters are defined by evenly spaced characters and round open loops.